Leeks get a lot of play in Irish cooking, being another of the vegetables that don't mind the island's cool climate, and can grow on poor ground with relatively little preparation of the garden or field. To make the shortcrust pastry: Mix together the plain flour, salt and butter in a large mixing bowl. Using fingertips or a pastry cutter, rub the butter into the flour until the mixture resembles fine breadcrumbs. Mix in 2-3 tablespoons cold water and knead the mixture lightly to form a firm dough. Wrap the dough in plastic wrap and chill in the refrigerator while preparing the filling. 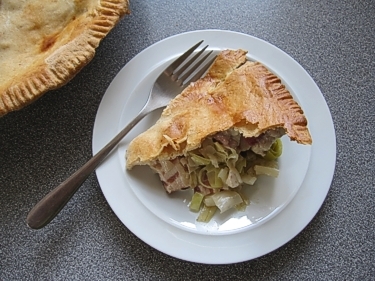 In a deep 1 to 1 1/2 quart pie pan or similar ovenproof container, place layers of the chicken, the ham, the leeks, the chopped onion or scallions, and a sprinkled pinch of the nutmeg, along with the salt and pepper; repeat until the dish is full. Add the stock. Dampen the edges of the pie dish; then roll out the pastry to half an inch wider than the required size. Place the pastry over the pie, letting the edges hang down outside, and crimp down the top edge well against the edge of the pie dish with a fork. Make a small hole in the center of the crust. (This is for pouring in the cream, so be careful to make it big enough to work with.) With trimmings from the rolled-out crust, make a few small leaf-shapes and decorate the top of the pie with them, laying one of them very lightly over the hole in the crust. Brush the pastry lightly with milk and bake the pie in the center of the oven 350° F. If the top starts getting too brown too quickly, cover it with a sheet of dampened baking parchment paper. When the pie is cooked, remove from oven and put aside. Gently heat the cream to steaming hot, being careful not to let it boil. Carefully lift the pastry rosette protecting the hole in the top crust of the pie, and pour in the cream. Replace the pastry rosette and serve, possibly with boiled new potatoes, or a green salad on the side.